1. The old standby: pay cash. When all else fails, you can always pay cash for a car. That will limit your car options to the size of your bank account, but it will enable you to buy a car without either a loan or a cosigner for the loan. The more car that you want to buy, the more cash you will need to make it happen. If you donâ€™t have enough money to buy the type of car that you want, then youâ€™ll have to look for other ways to increase the amount of cash you have â€“ or you will have to buy less car than you had hoped. Sell the car you have now; you generally will get more money by selling it yourself than by trading it in to the dealer. Sell any other possessions you have to help raise more cash; have a garage sale and sell what you can either on Craiglist or eBay. Sell stocks or other investments you have â€“ you probably need a car more than you need investments. Get a gift from a family member â€“ they may prefer giving a gift to cosigning a loan since it wonâ€™t affect their credit standing. When all else fails, consider taking a cash advance on a credit card. Just make sure you set up a payment schedule and pay it back in no more than one or two years. If you have bad credit you probably donâ€™t have credit cards either, at least not ones with credit lines large enough to pay for a car. But there are different degrees of bad credit, and if youâ€™re on the higher end (not so bad credit) you may be able to combine a credit card advance with one or more of the other methods listed here. 2. Get a loan from a family member or close friend. Draw up a note spelling out all the terms of the agreement, to be signed by both parties. Set up regular monthly payments that will pay off the loan in the shortest time frame possible. Be sure to make your payments on time every month. Give strong consideration to getting a part-time job â€“ or other additional income source â€“ so you can earmark income specifically to pay off the loan. Of course, getting a loan from a family member or close friend is not without complications. If for any reason you are unable to repay the loan, or to pay according to the agreed-upon schedule, you could end up ruining an important relationship in your life. Think hard before you do something like this; it should only be done if your situation is truly desperate. 3. Try car dealer financing. The car dealer may be able to arrange financing for you. Just keep in mind that the type of loan youâ€™ll get â€“ and the terms that will involve â€“ will depend entirely upon how bad your credit is. If your credit is on the not-so-bad end of the spectrum, the dealer will probably be able to arrange financing that will look very much like a bank loan, except that it will carry much higher interest rate. If your credit is on the really bad end of the scale, you could end up with a direct dealer loan that will come with a very high interest rate, as well as a requirement to make your payment each month in person, and even to pay them in cash (ie, “we don’t trust your check to not bounce”). These loans contain all kinds of â€œgotcha provisionsâ€ that will have you owing more on the car than it is worth, financing it for longer than is reasonable, and being subject to repossession for the slightest offense. You might be better off buying a bicycle or planning to rely on public transportation than taking that last kind of loan. 4. Buy a â€œbeaterâ€ and trade your way up. If you cannot get a loan at all, thereâ€™s always the option to buy a beater. These cars tend to be older and in poor condition â€“ you can think of it as a starter car. You can buy the best car you can afford with the cash you have, and plan on putting money aside in a savings account each month as if you are making a car payment. The idea is to drive the beater while you are saving up money to purchase a better car, one or two years into the future. To go this route, youâ€™ll have to make sure that you are putting away a reasonable amount of money each month. Not only will you be saving money to buy a better car later, but at least some of what you save will go into paying for repairs on your beater. It could be a long slow road to your next car, but if you canâ€™t get a loan and you can’t get a cosigner, this can be the difference between having a car and needing to invest in a better pair of sneakers. 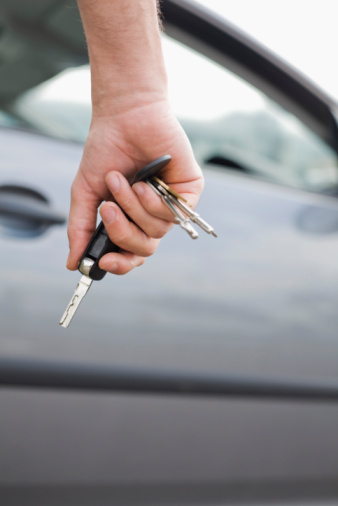 What would you do if you needed to buy a car and had bad credit and no cosigner? Leave a comment! So if I happen to have no credit, how am I going to get approved for a car loan? … With bad or poor credit, the only way you will be approved for no cosigner car. Hi Jerry–The purpose of the post isn’t to show you that you shouldn’t use a cosigner, only what to do if you don’t have one. Cash is king. I think a lot of people forget you can buy a car with cash (thinking you have to take out a loan). Thankfully after our car flooded, bf and I bought out new one with cash.